Home Kids Room Decor Super Hero Bedroom Ideas DIY Super Hero Room Ideas Super Cool Super Hero Storage! 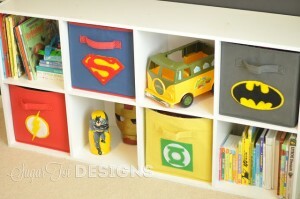 Super Cool Super Hero Storage! When you have kids you know that the “toy situation” is always a crisis. I’m not even sure where all that crap comes from! This tutorial includes templates for a DYI storage cube makeover. The end result is nothing short of amazing! Plus you can use a simple cheap cube shelf from Target or Ikea & they still look custom. Make Your Own Comic Book Art!